There are a few possible reasons why your call recording with the HubSpot calling tool did not save on a contact's timeline. Click to toggle the Enable recording switch on or off. If this setting is disabled, the Record button will not appear when making a call. If you are not seeing the option to record, check with the other admins in your account to see if they have turned this setting off. Some areas have two-party consent laws, which means both parties (the caller and the contact receiving the call) must consent to the call being recorded. If you're often calling numbers from U.S. states that do not require two-party consent, you may be used to your calls recording by default without you needing to click the Record button when making the call. 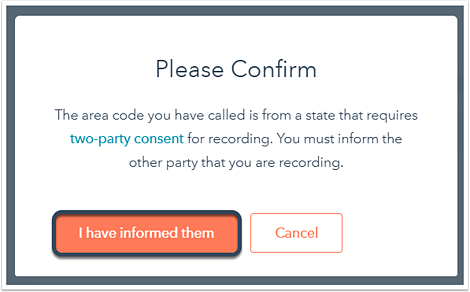 However, when calling one of the 13 U.S. states or placing international calls where two-party consent is required, you must click the Record button. In the pop-up box that appears, you must select I have informed them to confirm you have obtained consent from the recipient to record the call. If you do not click the Record button and confirm you have consent, then the call will not be recorded. If the Record button is red when the call ends, the call recording will be saved. However, if the recording is turned on at the beginning of the call and then turned off before the call ends, that recording will not be saved. To record your call, make sure the recording button is on when placing the call, and do not turn the recording button off at any point during the call. Once the call ends, click the Save button so the call and the recording is saved to the contact's timeline. Any user with access to the contact timeline can delete a recording by clicking the delete icondeletenext to the recording and confirming the deletion in the pop-up window that appears. If a recording you previously saw on a contact timeline is missing, check with any users in the account who are also working with that contact to see if they deleted it.